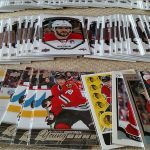 Ever since I started collecting hockey cards again in 2006, Upper Deck Series One and Series Two are the sets that I always look forward to. 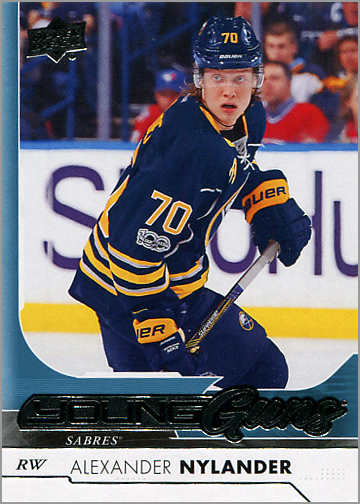 UD’s flagship hockey set, which as been around since 1990-91, has a great variety of veterans and rookies, is relatively affordable and always has excellent photography. 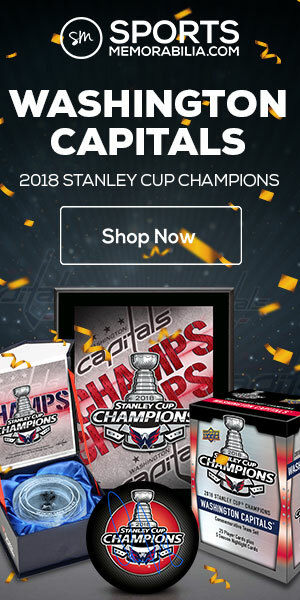 This year’s set is selling for about $73 USD online for a 24-pack hobby box. Each pack has eight cards. 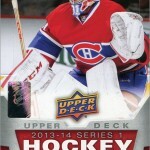 Upper Deck Series One was released in November 2017. I recently got a box, and finally got a time to post my break for your enjoyment. The box I opened had 165 base cards. 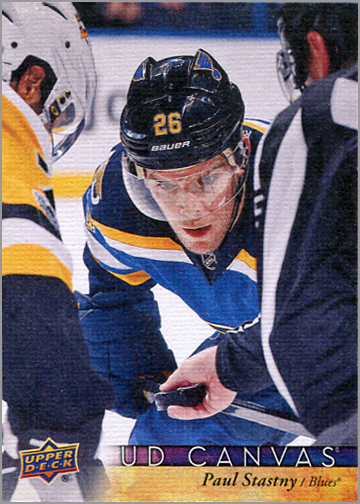 This year, Upper Deck seems to have used a lot more horizontal photos on the cards in Series One. The photography is exciting, as always, and the design looks nice without being distracting. Another nice touch is that there were no duplicates among the 165 base cards in this box. 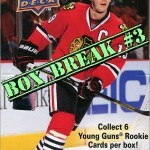 The real reason most people buy Upper Deck Series One is to get their hands on the Young Guns rookie cards. The YGs I got are Flip Chytil, Janne Kuokkanen, Lucas Wallmark, Ivan Barbashev, Alex Tuch and Alexander Nylander. 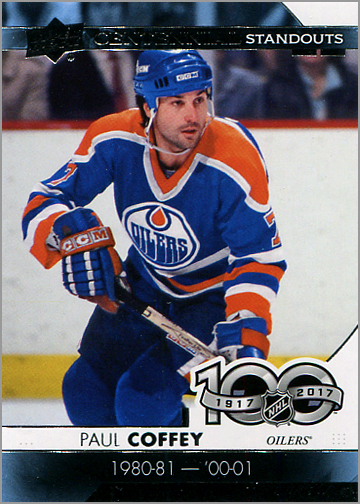 New for this year are the Centennial Standouts, which tie into the NHL’s 100th anniversary and its naming of the 100 Greatest NHL Players. 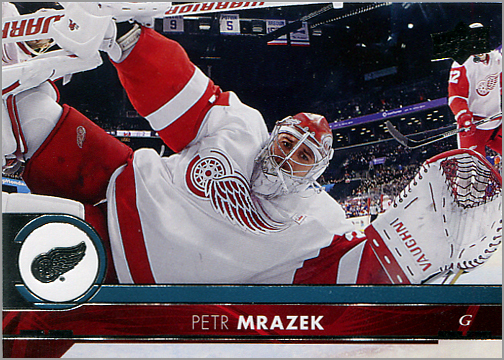 This is a nice insert set, as it is heavy on nostalgia and features some old school players. 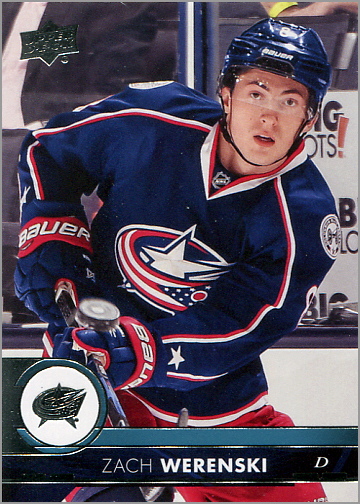 The five Centennial Standouts I got are Teemu Selanne, Paul Coffey, Claude Giroux, Steven Stamkos and Patrick Kane. 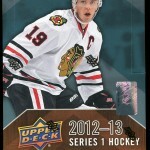 Upper Deck’s popular “set within a set” is back for another year. These cards have a slight canvas-y texture to them, hence the name. 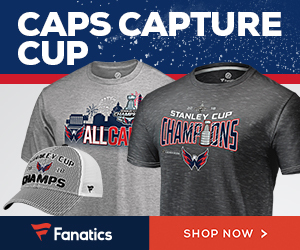 The four I got are Thomas Greiss, Jeff Carter, Nicklas Backstrom and Paul Stastny. Also back for another year are UD Portraits, which are in black and white this year. 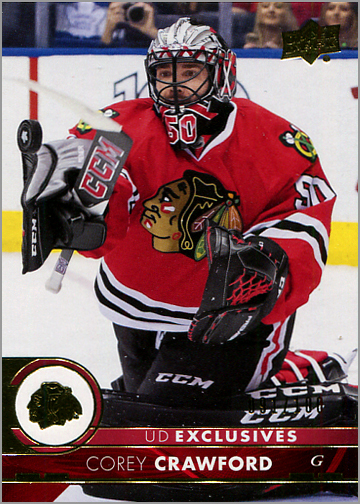 I do wish these cards used studio portraits and that the players had their helmets/goalie masks removed. In addition to Brock Boeser, I also got cards of Leon Draisaitl, Patrick Laine and Evgeni Malkin. Shinning Stars cards are, according to the sell sheet, “printed on lustrous foil board” and are found three per box. The three I got are Tyler Seguin, John Gibson and Max Pacioretty. 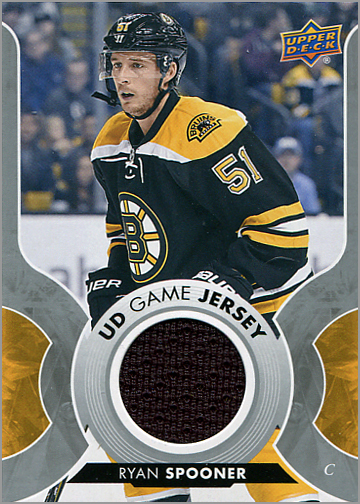 Finally, a game-used jersey card of Bruins center Ryan Spooner. Wait…only one game-used jersey card? 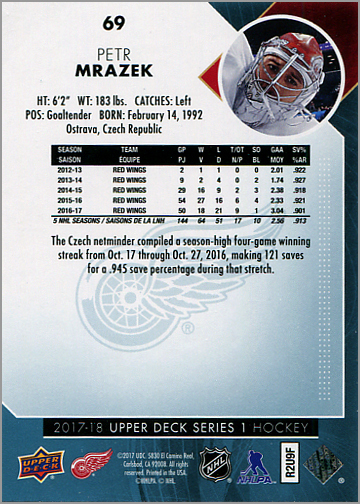 While I am not really a fan of game-used cards, it appears that Upper Deck reduced the amount of them in Upper Deck Series One, but kept the price point around the same. 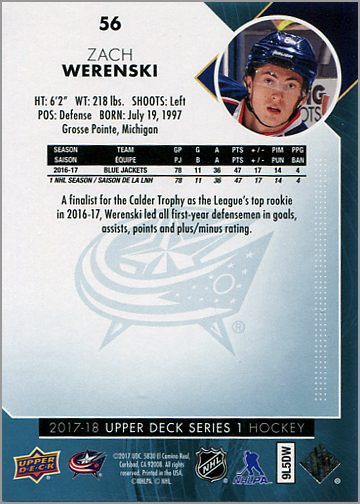 If these are the most expensive card to make, and there is one less of them per box than in years’ past, then the price should have dropped accordingly. 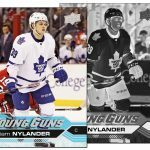 What I like about 2017-18 Upper Deck Series One Hockey: Great photos and player selection. Getting six Young Guns rookie cards. 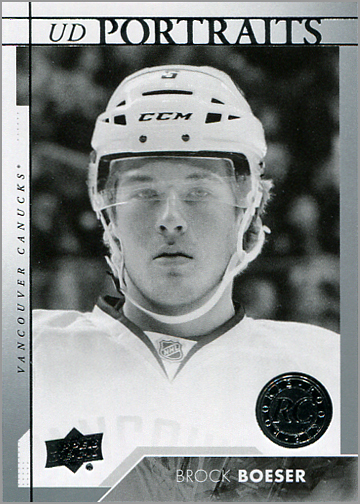 Making the UD Portraits in black and white is a nice change of pace. 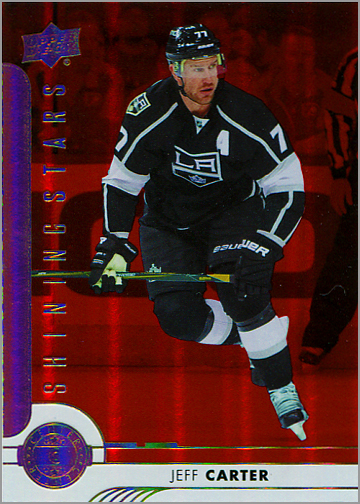 The UD Exclusive parallels are more noticeably different from its base counterpart than usual. 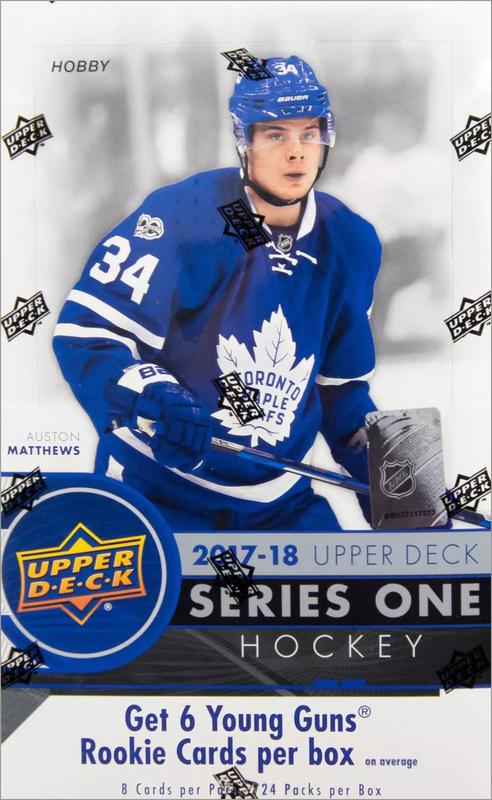 What I do not like about 2017-18 Upper Deck Series One Hockey: Shinning Stars has not really grown on me over the years, so I could do without those. Reducing the amount of Game-Used Jersey cards from two to one per box, but not reducing the price too, seems a bit unfair to collectors who pony up the extra bucks for a hobby box. I got a box for Christmas. I wasn’t lucky enough to pull a UD Exclusives or anything else numbered, but I did pull an autograph to go along with the one per box jersey. Personally, I could have done without the Shining Stars and especially the Portraits, I would have been happier with more base cards. But I’m a set collector. Agreed. 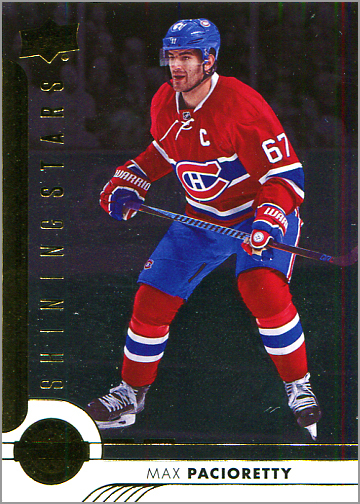 Shining Stars and Portraits have been inserts for years now and are throwaway cards to most. Whose autograph did you get, Bill?